"A man will turn over half a library to make one book." 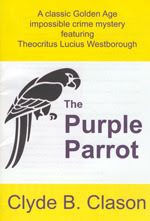 Contrary to the usual modus operandi of Clyde B. Clason, The Purple Parrot (1937), fourth in the series featuring the meek little professor Theocritus Lucius Westborough, was written from the perspective of one of the characters, Barry Foster, a lawyer who's hopelessly in love with the ward of one of his clients – a rich and influential book collector named Hezekiah Morse. Morse has hand picked a suitor for his granddaughter Sylvia, a personal friend and next door neighbor, Thomas Vail, and has drawn up a will that effectively disinherits her if she dares to marry anyone else except for a paltry statuette of a purple parrot from New Zealand. As one of Morse's lawyers, Foster is more than aware of this new development and has decided to confront him, but someone beat him to it and stuck a knife in the old bibliophile! What's worse, all of the evidence seems to be pointing an accusing finger at Sylvia. Morse was stabbed in his study/library and one of the doors was locked from the inside and Sylvia was in the adjoining room holding the only unlocked door under constant observation, but no one was seen either entering or leaving the room (and premise) since their arrival. She also has plenty of motives for wanting her grandfather out of the way. 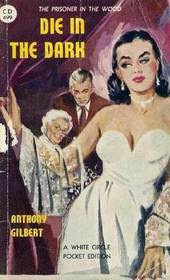 Luckily, Lt. Johnny Mack, "a bluff, old-school Chicago police detective," owed a favor to that quiet professor of Roman history, Westborough, and gave him permission to follow him around during his next assignment – and he's not convinced of Sylvia's guilt and attaches great importance to the missing statuette of the bird. But why would anyone kill in order to obtain something that isn't even worth the trouble of stealing in the first place? Westborough has a lot of woolgathering to do before he can even begin to disentangle a plot involving, among other threads, a bootlegger and a well stocked wine cellar, a library filled with rare editions and how the psychology of Edgar Allan Poe's "The Purloined Letter" fits in with the ancient tomes stored on its shelves and the life-saving role of Samuel Johnson's A Dictionary of the English Language (1755). Clason was a writer from the Van Dine-Queen School and his work is exemplary for this school, but The Purple Parrot felt as the most Van Dine-like of his books (The Parrot Murder Case!). Here Westborough isn't visiting an estate to make a discreet enquiry into the disappearance of a jade figurine of a Taoist goddess or descending into a Colorado goldmine as one of the shareholders, but here he plays the Philo Vance to Mack's Markham and with Morse's residence (with its private library full of rare, first editions) as the center of all the action – it really helped establish that Van Dinean feeling. Minus the annoying presence of Vance, but with the insightful tidbits of information and lectures! The part were the police were analyzing the pool of blood and compared it with the witness statement, in order to determine a more exact time of death, was especially interesting and gives the reader a peek through a window in time showing forensic science before the DNA/digital era. That's why I don't get the solution. I mean, I understand who stabbed Hezekiah Morse, and all that, but not why Clason opted for an explanation that effectively turned an intelligently written story into a gaudy parody of a shilling shocker. This book was published in 1937! What was Clason attempting to do here? By all accounts, Clason was an intelligent man and I refuse to believe that this was his idea of a "spoof" or a "least-likely-suspect"-scenario. I'm even more baffled that it came as a follow-up to a far more convincing solution, and Clason knew it was good, because he retooled it for one of his later novels. Maybe it was challenge to make this particular scenario as convincing as possible or perhaps we're all missing the punch-line of a now long forgotten inside joke. All in all, I would still recommend The Purple Parrot to fans of the series, but I advice readers new to Clason and Westborough to start off with The Man from Tibet (1938) or Poison Jasmine (1940). The wonderful Rue Morgue Press has made most of Clason’s work available again. On a final note, Less Blatt also reviewed The Purple Parrot in one of his weekly audio reviews. 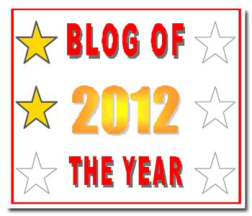 Over the course of the past several days, Beneath the Stains of Time was picked by two fellow bloggers as one of the best mystery/crime blogs of 2012 and I want to thank them for keeping this niche on the digital crime circuit in mind when they gave out the awards. Sergio from Tipping My Fedora, which turned two this month, and Pierce from The Rap Sheet honored me with the title and was somewhat surprised by the latter – ‘cause the content of our blogs run in completely different directions. But I definitely appreciate it! Now it's up to me, in turn, to name the next recipients and I have decided to not go for the usual suspects that already procured several nominations. 2 Write a blog post and tell us about the blogs you have chosen – there’s no minimum or maximum number of blogs required – and ‘present’ them with their award. A regular review will be up ASAP. But the silence was unbroken, and the darkness gave no token..."
Mr. Arthur Crook is looking over the Record on the morning of April 14, 1947, when an advertisement, under the header "Rest and Refreshments," beckons his attention and gives a translation in his own words: "Rich dame wanted as sole payin' guest in a house in a lonely wood. No one else allowed over the threshold." Mrs. Emily Watson has read the same ad and is our damsel-in-distress in Anthony Gilbert's Die in the Dark (1947). Well, I have to admit, Mrs. Watson, a fifty-year old widow, doesn't match the image of a tormented maiden, kept imprisoned in a crumbling manor home, but that doesn't make her ordeal any less excruciating. Mrs. Watson has excellent reasons to assume that the people nearest to her are plotting to siege control of her estate, claiming that she has gone soft in the head, and the advertisement in the Record offers a temporary escape – as well as a mean to unsettling the plans of her money hungry nephew. Dr. Forrester and his wife, Mrs. Watson hosts, appear to be nice and understandable people, but before long, she begins to question the good intentions of the Forrester's and eventually even her own sanity. Die in the Dark shares some interesting similarities with one of Gilbert's previous novels, Something Nasty in the Woodshed (1942), and I almost suspect Dark to be a re-write of Woodshed. Woodshed and Dark open with a newspaper advertisement, asking respectively for a spinster and a lodger, but they are both meant to lure a rich and lonely woman to a secluded spot. Woods that are reputedly haunted surround the houses. In Woodshed, it's the earthbound spirit of a woman and her ghostly appearance is actually relevant to the plot, while Dark briefly touched upon the parachutists who died over the forests during the war – never found and doomed to wander the woods forever. Something should've been done with that! Of course, once these women realize that they may've been safer had they gone to Camp Crystal Lake, they have to face whatever is lurking there... or being hidden from them. Woodshed explains itself, but Dark has an abandoned, dilapidating cottage, tucked away in the dark forest, where Mrs. Watson makes an unnerving discovery. The two-part structure of Dark also reflects Woodshed, in which the first section can be read as a suspense story with an open ending and in the follow-up Arthur Crook tidies up the loose ends for the curious – as well as settling the score in his own particular way. Unfortunately, these aftermaths appear to be unable to carry the momentum from the first into the second part of the story, and perhaps that's because the style is a radical departure from the pure, suspenseful storytelling of the previous part. What I liked about the first part of Dark is that you're never quit sure if Mrs. Watson is the victim of a dark plot or of her own delusions and that was lacking in the second half of the novel. All things considered, this was an engrossing story of suspense and even though it's not a classic example of its kind, you can still loose yourself in it for a couple of hours (only 150+ pages to cover) and I suspect that was Gilbert's plan all along. What's Plaguing Your Mind, Dr. Twist? "Every magic trick consists of three parts, or acts. The first part is called the pledge, the magician shows you something ordinary. The second act is called the turn, the magician takes the ordinary something and makes it into something extraordinary. But you wouldn't clap yet, because making something disappear isn't enough. You have to bring it back. Now you're looking for the secret." I have spoken disapprovingly of the people who hailed Paul Halter as the second coming of John Dickson Carr or G.K.Chesterton, because his detective stories, clever and fun as they may be, simply aren't in the same league and it was unfair to place such high expectations on non-French readers, but La Septième Hypothèse (The Seventh Hypothesis, 1991) may very well be a fulfillment of that prophecy – even if it's more reminiscent of Joseph Commings. If you liked The Seventh Hypothesis, you should read "Murderer's Progress," collected in Banner Deadlines (2004), as comparison material. Halter also litters the story with subtle references to Carr's work, which makes for a fun little side game. On the other hand, Halter made a triumphant attempt in reviving that "Baghad-on-the-Thames" atmosphere of a long-gone London in The Seventh Hypothesis and the opening is a nod to Carr's The Arabian Nights Murder (1936). Edward Watkins is a police constable to whom nothing ever happens, until the night of August 31, 1938, when he's pounding his regular beat and catches a fleeting glimpse of somebody robed in the attire of a seventeenth century plague doctor, but the night has more in store for the constable! 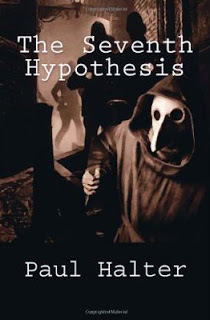 Not long after seeing the plague doctor, Watkins bumps into a suspicious looking character referring to himself as a Doctor of Crime and appears to be in middle of a body dump, however, upon inspecting the three suspected trash bins, the constable finds nothing that shouldn't be there – such as a body or the proverbial smoking gun. Before saying adieu, Dr. Marcus (a.k.a. D.O.C.) gives Watkins a less-than-subtle hint to delve once more into the bins and actually finds a body in one that he had looked into moments ago! But an even more astonishing feat involves Dr. Marcus and the plague doctors. A couple, the Mindens, who run a seedy boarding house, come forward to report the miraculous disappearance of one of their tenants, who somehow contracted the plague and was carried away by two plague doctors, however, halfway down the corridor the patient simply dematerializes – without any place to hide or escape from. Interestingly, the problem of the body that appeared out of nowhere and the inexplicable disappearance of the first person to be stricken down with the plague are not the main concern of The Seventh Hypothesis, but one that is brought to Dr. Alan Twist and Inspector Archibald Hurst by Peter Moore – secretary of the noted playwright of twisted mysteries, Sir Gordon Miller. Twist and Hurst listen to the account of Moore that reduces everything up to this point in the story to mere pawns on the chessboard of two devious, but criminally inclined, minds and everyone else is caught in the middle of their schemes. This is where Paul Halter excels himself as a mystery writer. He leaves his reader with two suspects to pick from and succeeds in leaving you hanging between the two, and subsequently keeps drawing you away from the murderer. Halter has always showed how much he loved playing the grandest game in the world, but here he proved that he can come in first as the undisputed winner. I also love this steady rise in quality, but I think it would be hard to top this one. Naturally, we should not neglect to bury John Pugmire under a mountain of praise for pouring out a regular stream of first-rate translations of French impossible crime stories. I know I can be slow when it comes to new publications, but anything that comes from Locked Room International has top priority. Oh, the battling masterminds was so absorbing that I almost forgot to comment on, what is after all, a specialty of mine, the impossible crime – and there are two of them in The Seventh Hypothesis. I like to brag that I immediately solved the first impossibility, but than again, having watched a lot of Leverage and Hustle did make it easier than it already was. The second one was a lot trickier and complex, but not bad and what's more important, they were both well explained and properly motivated. So... I have nothing to nitpick about this time and I think we should all give Patrick the time he needs to get accustomed to that idea. By the way, he also reviewed this book over at his blog. Go read it, if this review wasn't enticing enough. You know what... read it, anyway. 'Cuz some Tyrannosaurus could be hungry for us..."
Dr. Orpheus Preson is a mammologist, attached to the Broadly Institute of Paleontology, whose books guide the general public through the pre-history of this planet and is working on the second volume of The Days Before Man, but a series of newspaper advertisements in his name has disturbed his peace of mind. The advertisements are requests for unusual employers to appear for a job interview and someone even ransacked Dr. Preson's office to remove the labels from the bones he was working on. Unfortunately, the police can do little to remove this pest from Dr. Preson's life and driven to desperation, appears to have mixed a lethal dose of Phenobarbital with his morning milk, and evidence has surfaced that suggests that Preson has been persecuting himself. But was it really a botched cry for attention? 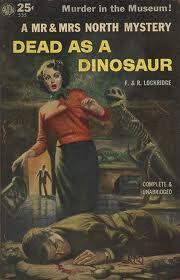 This is the premise of Frances and Richard Lockridge's Dead As a Dinosaur (1953), in which Pam and Jerry North are lured yet again into a murder case, however, they are somewhat innocent this time – as it was North Books Ltd. that published The Days Before Man and Preson did ask Jerry's help in this matter. And there’s more than enough to work on. Orpheus Preson has left everything he possessed in life to the institute, but his family plans to contest the will, because Orpheus was evidently of unsound mind when it was drawn up. Dr. Jesse Landcraft, a retired scientist, is the second person to die and his death leaves no questions whether it was murder or suicide, and casts a new light on the poisoning of Preson. The body of Dr. Landcraft was, more or less, put on display in an exhibit enclosure at the Broadly Institute, showing a recreation of a prehistoric cave with a man, and the murder weapon was an ancient stone hammer – placing this one firmly in the Van Dine-Queen tradition. Bizarre murders? Check! Specialized background? Check! Family names with literary allusions? Check (Orpheus has a brother named Homer)! Buddy cop(s)? Check! Ingenious solution? Eh... 50/50? In my opinion, the persecution plot and subsequent poisoning of Dr. Preson was the most impressive part of the story, simple but clever enough to satisfy, while the only real point of interest in the murder of Dr. Landcraft were the circumstances in which his body was found and the newspaper headlines that followed in the wake of his death. I also felt that this was point that the story had run its course and that made all the moving around towards the end a bit tiresome, but overall, a decent enough detective story from a couple who are still being read today – and I can see why. Frances and Richard Lockridge may not always have been on the top of their game, but Pam and Jerry North (and the characters orbiting around them) are nice, intelligent and sophisticated characters and there's an affinity for our feline friends running through the books, which must appeal to today's readers of cozies. Before ending this post, I want to direct your attention to my review of Voyage into Violence (1956), which I thought was a class-act mystery from the Lockridges. "To say goodbye is to die a little." In season finale of the fourth season of Leverage, we were left with the promise that more laws would be broken in the course of justice in the fifth, and final, run of the series and The (Very) Big Bird Job has the team squiring off against a crooked airline executive whose Achilles' heel is technical masterpiece from a previous era – Howard Hughes' Spruce Goose. The Spruce Goose is one of the largest airplanes ever build, flown only once on November 2, 1942, and Nate Ford and his crew have to find a way to get that machine back in the air in order to take their mark down. Not one of the cleverest (or believable?) episodes, but therefore not any less enjoyable. The Blue Line Job has a son putting the life of his father, an "enforcer" of a minor league hockey team, in the hands of the Leverage team and their opponent is the hockey team's owner – who turned the game into street fight on the ice and even paid players from rival teams to go after his enforcer. But there's one problem. Craig Marko, the enforcer, is literary beaten up to the point that the next bump he takes to the head might kill him, and if that one doesn’t finish him, the one after that may do the job. Enter Elliot Spencer, "The Hitter," who becomes one of the players to prevent this from happening until they can put the team's owner out of the game and the ending shows Nate being very in his role of evil, but just, avenger (c.f. the ending of The Cross My Heart Job). He's like a mask-less and cape-less crusader, but he did have (briefly) a Bat Cave (of sorts) in The Last Dam Job! In The First Contact Job, a low-grade, but loaded, scientist uses his personal wealth to attract truly talented scientists, pinch their ideas, and claiming them as his own – burying his victims in legal papers in the process. Well, he finally gets the opportunity to make the greatest scientific discovery in history, all on his own, establishing contact with an intelligent alien life form. But remember the rules of the con: when something is too good to be true, it usually is. The French Connection Job takes place at a culinary art school, run by a man who taught Eliot that a knife can do more than just stab people, but the restaurateur has turned the place in the base of operations for an unusual smuggling ring. This premise is also used to build up the characters of Eliot and Parker. The Gimme a K Street Job has Nate and his Merry Men staring down one of their toughest opponents: politicians! A cheerleader gets seriously injured due to corporate negligence, because cheerleading isn't considered a legitimate sport and therefore doesn't have to comply with safety regulations, and they have to overthrow the unscrupulous owner of the cheerleading squad as well as getting a bill passed through Congress. But as Sophie remarked, after spending a day peddling between Congressmen, "I don't know how anything gets done around here. You have to be a grifter to run government." 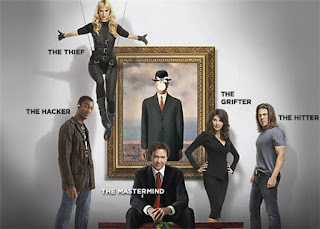 The Broken Wing Job is a Parker, "The Thief," of the group, orientated episode, in which the high-flyer is grounded with a broken leg, and bored out of her mind, begins to watch the surveillance cameras of their restaurant, doubling as their hideout, when she notices two shady guys plotting at a table. One of them carrying a gun. Parker has to work as an armchair detective to figure out who they are, what they are planning and how to stop them. We also learn a little bit more of the ongoing storyline, which began in The (Very) Big Bird Job, when the viewer learned that Nate and Hardison are sharing a secret. The Rundown Job and The Frame Up Job share the same set-up as The Girls' Night Out Job and The Boys' Night Out Job, from the previous season, in which the teams split and have separate jobs to take care off. 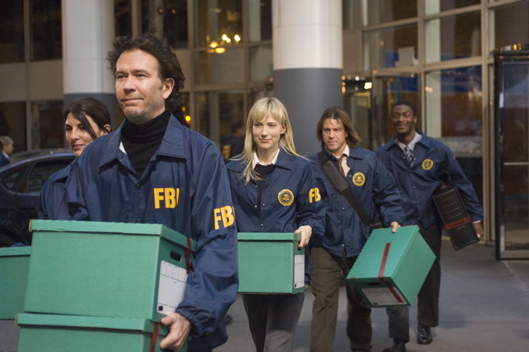 Eliot, Parker and Hardison are wrapping up business in Washington, when Eliot receives a phone call from the past, asking him to do a hit on someone. Elliot turns down the offer, but he knows if he doesn't take the job, someone else will and attempt to try to stop an assassination – and hit upon on a conspiracy. The Frame Up Job has Nate Ford and Sophie Devereaux, officially an item by this time, playing the bantering, mystery solving couple that were all the rage back in the 1940s and they do it with the same joie de vivre as the Troys and the Browns. Heck. Even the setting and multi-layered plot were very reminiscent of the detective stories usually discussed on this blog. Sophie tries to ditch Nate one day with a ticket to a Noir Mystery Movie fest, but traces her steps back to the estate of a recently deceased art collector, where the first painting of a modern master, never before put on display, will be unveiled to the public for the very first time – and Sophie has a personal connection to the painting. Of course, when the vault door swings open, there’s nothing in there to be seen, and as the only infamous (ex) art thief/grifter on the premise, Sophie has a lot to explain when Sterling shows up. The plot twists and turns from an art theft to a murder investigation to forgery, but the best part of the story was seeing Nate and Sophie as detectives/criminals (e.g. John Kendrick Bangs' Raffles Holmes and Lawrence Block's Bernie Rhodenbarr), and how the characters played off each other, because the plot was predictable. I recognized most of the plot devices and anticipated nearly every twist. A good try and tremendous fun to watch, but for the seasoned mystery fan, it's a walk in the park. The Rashomon Job, from the third season, was perhaps the best plotted episode from the series, in which five separate stories of the same event dovetail into one with the fifth telling and much more reminiscent of Agatha Christie than The Ten Lil' Grifters Job. In The White Rabbit Job, they receive an unusual request that consists of not taking down a company owner, hell-bent on destroying the company his grandfather build up and the town it supports, but to safe and restore him to his old self again. They decide to give the rarely attempted "White Rabbit" con a go, in which they drug the mark and put him through a series of dream sequences that Hardison conjures up from his computer, but this also poses a plethora of moral objections. Interesting premise, descent episode. The Toy Job opens with a whistleblower warning the team that a company wants to bring a dangerous toy on the market, ready to be released before Christmas, and they rummage around for a rejected/failed toy to re-brand and create a craze to overshadow their mark’s toy. But why pick a doll that looks like Chucky's deformed cousin, who appeared to have been brought into this world with the assistance of a rusty coat hanger? I think this a good point to mention that I have not yet seen The Low Low Price Job and The Corkscrew Job, and can't remember much of The Real Fake Car Job, which is why they are missing from this overview. Finally, The Long Goodbye Job has the team making an attempt at obtaining a secret file, known as the Black Book, consisting of all the dodgy transactions made during economical collapse of 2007-08 and the names of people who created the crisis, and use it as a hit list. But when the episode opens, we learn that something has gone horribly wrong and Nate has to relate story of how his team perished during a pursuit for those secret files. I can't tell no more without spoiling anything, but the second half of the episode was almost too light to follow up the high-strung drama of the first part. But not a bad way to bow out. Not bad at all. And note the similarities between the main set-up of The Long Goodbye Job and The Con is Off, the final one for their BBC counterpart Hustle. Yes. 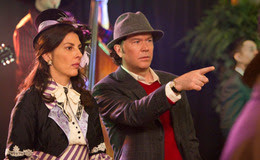 I had not forgotten about me compulsively obsessing over a Hustle/Leverage crossover that's now never going to happen. Why would anyone cancel a series that can balance between dark/gritty and light/comical and oozes viewer entertainment? Oh well, I can always re-watch Hustle. The next post will be a proper review of a classic whodunit. "Do not allow evil into your heart, it will make a home there." It's January 1304 and the inhabitants of Mistleham, Essex, left a turbulent year behind them, in which their Lord Scrope massacred as heretics the members of small religious sect known as the Free Brethren, expounders of the doctrine of free love, and left their bodies hanging in the trees of the forest surrounding a deserted village where they camped out – meant as a dire warning to anyone planning to stir up trouble in Mistleham. In the intervening time, King Edward I dispatches his dutiful emissaries, Sir Hugh Corbett, Keeper of the Secret Seal, and Ranulf-atte-Newgate, Clerk in the Chancery of the Green Wax, to Lord Scrope's district to restore order and retrieve a golden cross embedded with blood red rubies that he stole from the Templars and promised to the King. There's also the matter of a dagger that was looted from the King's vaults and is currently in possession of Lord Scrope. Corbett and Ranulf have their work cut out for them, but upon their arrival, they learn that a bowman has appeared, going by the moniker Sagittarius, blowing a hunting horn before plucking the string of his longbow felling one person after another in a murderous frenzy. 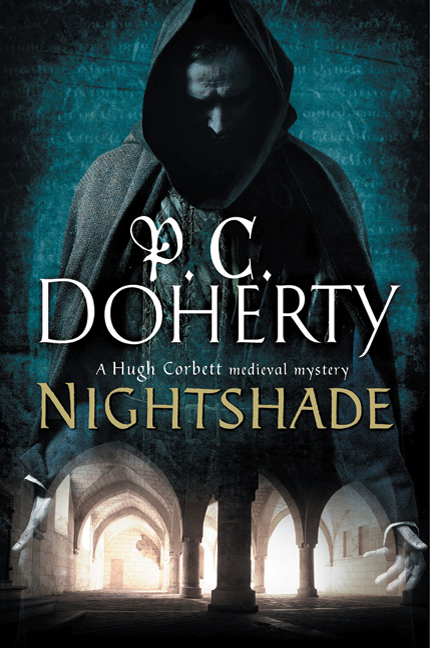 This is the premise of Paul Dohert's Nightshade (2008), a historical mystery novel that’s covered with Doherty's fingerprints as he touched upon everything you come to expect from him in a Sir Hugh Corbett mystery, but like The Mysterium (2010), it's a good example of a story that works well within the formula of the series. Plus the ton of historical information and how fact and fiction are tied together usually makes them an interesting read whether the plot works as a detective story or not. 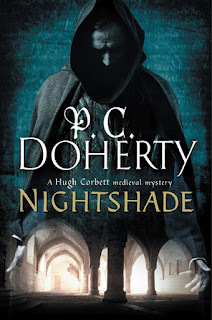 I'm not sure how relevant this observation will end up being to the review, but I found it interesting how Nightshade displayed nearly everything that I came to associate with Doherty's work. In The Demon Archer (1999), Corbett and Ranulf were send to the estate of the murdered Lord Henry Fitzalan, who was under siege from an avenging bowman known as the Owlman, and both Lord's had a sister in the church whom played an important role in both stories. Doherty also has penchant for constructing plots around war heroes who attempted to blotch out their past crimes, by and large committed on the battlefield, before a shadow from the past catches up with them. In this particular case, Corbett has to find out what happened during the fall of Acre, when Scrope stole the Sanguis Christi from the fallen Templars, before he can officially close the book on these murders. But I have to say, the characterization of the main villain here was a little less straightforward. He was obviously not a very nice man, but you get glimpses of another side of character, for example, his bravery and a restless conscience, presenting a character that choose to be evil in order to obtain his dreams – rather than just being it. Doherty is also known for his affinity for the locked room mystery, perhaps even being the most prolific mystery novelist on this side of the Atlantic who specializes in miracle problems, and while they aren't in the same league as John Dickson Carr, they can be quite clever – in a simple and straightforward matter. Nightshade has one of those clever, but simple, impossible situations. As to be expected, Lord Scrope has to answer for his sins at the hands of his self-appointed executioner, but you can’t blame a man from trying escape the cold steel of an assassins blade or a swiftly loosened arrow, and the Lord of the Manor has erected a reclusorium on the Island of Swans – enclosed by thick vegetation and an icy cold moat surrounding it. Guards on the embankment keep an eye out for intruders and the reclusorium can be sealed from the inside. Doors locked from the inside. Shutters fastened. And no way anybody could've reached the island. But somehow, someone managed to cross the freezing waters without a boat, phase through solid wars and bolted doors like a ghost and stick a knife in the heart of a warrior who didn't put up a fight – as well as leaving an untouched goblet poisoned with the titular nightshade. The solution is not bad and fairly hinted at, but not exceptional, however, it beats the one he offered in Corpse Candle (2001). Overall, a fairly good yarn and Paul Doherty knows how to spin them! "I'm not the law, but I represent justice so far as my feeble powers go." I cherished the hope that with the passing of another year, and the beginning of a new one, I could accelerate my reading pace, which has slowed considerably over the past month, but the first week of 2013 almost draws to a close – and I haven't even reached the halfway mark of the New Year mystery I have been reading. 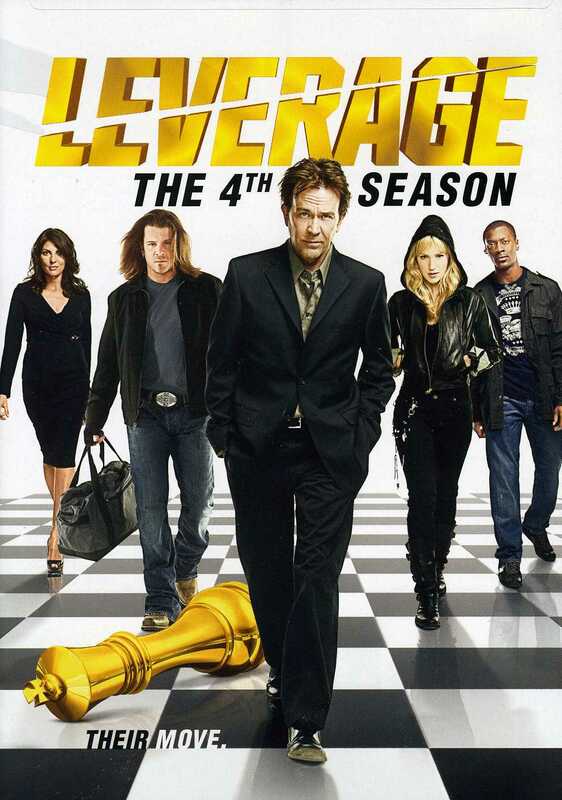 So, in lieu of a proper review, I have compiled a rundown of the fourth season of Leverage. The fourth season successfully maintains the quality of the previous batch of episodes, and even ups their game, beginning in The Long Way Down Job when the team scourers an Alaskan mountain top for a missing climber and the evidence he was carrying to bring down a shady financier. We're also getting a glimpse of the main storyline that runs through all these episodes when they discover that their office has been bugged. Next up is an homage to the classics of yesteryear, The Ten Lil' Grifters Job, in which they infiltrate a detective-themed costume party at an cut-off, island mansion and Nathan (Timothy Hutton), dressed up as Ellery Queen as a nod to his father, Jim Hutton, who played the role in the 1970s television series, becomes the prime suspect when their mark is murdered during a black out. Without question one of the most enjoyable episodes, but also disappointing in a way, because it just goes through the motions of the preconceived image people have of a classic whodunit and they missed a few opportunities (besides an actual clever plot a la Ellery Queen). While their hitter and retrieval specialist, Eliot Spencer, mingles with the guests hunting for leads, Nate is upstairs getting comfortable in his role as armchair detective, however, there's not a single allusion to Nero Wolfe and Archie Goodwin – in spite of the fact that Hutton played Archie in what's perhaps one of the best adaptations of a detective series that ever graced the small screen. And how neat would it have been if Nate or Sophie had said the following lines into Eliot's earpiece, "where force fails, craft succeeds." Kudo's to anyone who gets that reference! Character-wise, the most interesting episode of this season was perhaps The Van Gogh Job, in which the stories of Hardison and Parker run parallel with that of their client and involves a lost Van Gogh that was smuggled into the country after the war. The Massive Lady would have probably described this one as a love story with criminal interruptions. The Grave Danger Job continues to develop the relationship between Hardison and Parker when the former ends up being buried alive during a con on a family of undertakers, who swindle their clients and sell the identities of the deceased to a drug cartel, and they have to race against time to find him – as well as finishing what they started! The Boiler Room is another fun one, in which their mark is a third generation conman whose family invented half of the tricks in the book and how do you con a man who was brought up by the men who invented the game? Well, you play a game that he isn't familiar with and we learn the identity of the man who's being spying on them. The Cross My Heart Job has the team opposing a wealthy, but terminally ill, man who stole a heart that was donated to an ill 15-year-old boy and Nate, who lost his own son at a young age, takes this job personal – very, very personal. At the end, we get a peek of evil Nate. Evil Nate is fun. Mischievous, but fun. The Queen's Gambit Job is a bit lighter in tone, in spite of the job that consists of stealing a nuclear centrifuge calibration weight from a highly secured skyscraper in Dubai, during an international chess tournament, which they do as a favor to Sterling. As to be expected from his involvement, there will be double-dealings and crosses adding to the overall fun. Nate and Sophie are also developing a relationship, and from what I have seen of the next season, they're turing into one of those flirtious, comical husband-and-wife sleuthing teams. Except that they grift and steal things. The Girls' Night Out Job and The Boys' Night Out Job take place on the same evening when the girls (in the company of grifster Tara from the second season) and boys take an evening off to relax and enjoy themselves, but the girls end up tailing a good looking, internationally wanted man into an embassy and the boys have to try to keep a former mark they helped from getting killed by drug dealers. I think the night out with the boys was more fun and exciting. I mean, how could the other episode beat dropping Nate in the middle of an AA meeting? You simply can't! In a previous episode, Hardison expressed his desire to run his own crew one day and began to notice that he was slowly growing into the Danny Blue of the group. The Gold Job is the next stage in becoming the next big con artist when he leads a job against a pair of lecherous gold dealers and plans to write a new page in the playbook of the modern conman. Luckily, his team has his back on his first outing as the leader of a pack. 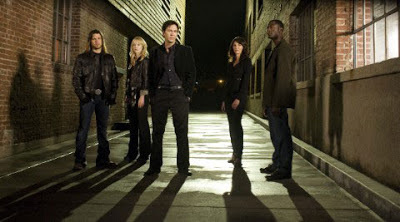 By the way, how awesome would it be if they put together a new team consisting of Hardison, Danny, Stacie, Parker and Eliot under the title Leverage International. Or Hustling for Leverage, if you want both shows in the title. It would also be a perfect vehicle to bring Nathan Ford and Michael "Mickie Bricks" Stone together. 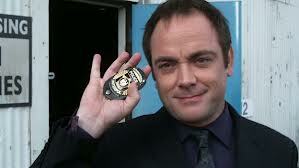 It would be like Lt. Columbo meeting Adrian Monk! Now, that's not too much to ask, is it? Yes. Every time I devote a post to either Leverage or Hustle, I'll mourn the fact that a crossover will never breach the boundaries of fantasy. Deal with it. The Radio Job and The Last Dam Job make up the final, two-part episodes of the season and has the team up against the man who bugged their office and an old enemy from the past – who wants to extract his own kind of justice on them for putting him away and bringing down his company. In The Radio Job, another familiar face pops-up, Jimmy Ford, who attempts to steal a document from the patent office, but things go array when law enforcement encircles the building. Nate pulls off an impressive con to get them out of there, but his old man has a trick up his sleeve and gets away with the patents – and he isn't getting much in return for his trouble. SPOILERS (select text to read): I know this is suppose to be his send-off, but if the series wasn't cancelled, we would've seen Jimmy Ford rise from the dead. Remember, Jimmy Ford is an old-time grifter and fixer who runs with what he's got (as witnessed by his crafty, but simple, escape from the patent office), and he has good reasons for wanting people to believe that he's dead (see: The Three-Card Monte Job). And what we hear doesn't always align with what we see. The Last Dam Job tips it hat to the final confrontation between Sherlock Holmes and Professor Moriarty, as the team has to recruit allies to mislead the one adversary who knows all their tricks, and thus we get the return of the master-thief Archie Leach, Parker's "father" and mentor, and the hacker "Chaos," but you guess what I was thinking when these characters were re-introduced. Yes. What a great way it would've been to bring in the Hustle crew. Anyway, there is a final, well-played confrontation at a dam that is very reminiscent of the scene at Reichenbach Falls (despite the modern scenery) and we have Ford holding his opponents at gunpoint (with his father's revolver) on the edge of the proverbial cliff. The main point of suspense is how he's going to deal with these powerful, relentless opponents and if he will go over the cliff himself by becoming a murderer. I know I skipped a few episodes, like the wonderful The Hot Potato Job, but it has become a lengthy post as it's and I think these snippets did a sufficient job at conveying my enjoyment over the sustained quality of the stories and characters that have really grown on me. 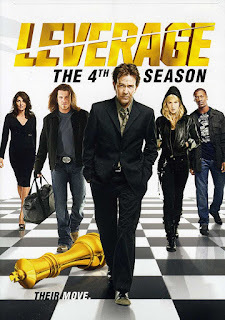 When I first blogged about this series, I thought it was a cut below Hustle, but Leverage upped its game, and now I think they bowed out on equal footing. One more season left to go!